Chandigarh: Haryana Chief Minister Manohar Lal Khattar on Wednesday said ten memorandum of understanding (MoUs) were signed with the UK for various projects entailing investment of around Rs 1,500 crore with employment potential for around 1,000 persons. Six MoUs were signed during a meeting with Lord Raj Loomba at the House of Lords, the chief minister told reporters here. 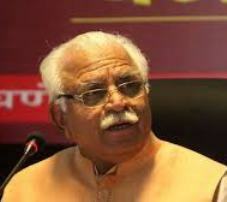 A delegation led by Khattar arrived back yesterday after a visit to Israel and the UK. The MoUs signed included that with Pontaq (UK India Innovation Fund), focusing on fintech, smart cities and emerging technologies; UK India Global Business Limited for promoting technology transfer, support services and establishing UK/European companies especially focused on Aerospace and Defence Sectors; Xelba Limited and AU Capital Partners Limited for undertaking Internet of Things (IOT) initiative. An MoU has also been signed with WKCIC Group for undertaking collaboration in skill development in Haryana, Khattar said. During the visit, the delegation has explored the possibility of collaboration with the Advanced Manufacturing Research Centre at Sheffield for setting up a facility in Haryana which would lead to influx of major players like Rolls Royce, Metaltech, Mclaren and Boeing, added Khattar. He said the delegation also held a meeting with Transport for London (TfL) which provided a broader perspective for implementation of a successful City Transport System for a growing city like Gurugram. A team from Haryana led by the Transport Minister or Transport Secretary would be tasked to visit UK to understand the principles and seek collaboration with TfL for developing a comprehensive Transport System for Gurugram, Faridabad and other urban areas in Haryana. Do you think Indian banks are on way to addressing the problem of NPAs? Shoonya.in aims at giving a new dimension to online business and economy English journalism. It is driven by a team of highly qualified journalists, researchers, experts and other professionals along with a dedicated team of reporters working and analysing various economic and welfare policies at the grassroots level.